Summary: Known for his critically acclaimed contemporary thrillers, New York Times bestselling author Phillip Margolin explores intriguing new territory in Worthy Brown's Daughter, a compelling historical drama, set in nineteenth-century Oregon, that combines a heartbreaking story of slavery and murder with classic Margolin plot twists. One of a handful of lawyers in the new state of Oregon, recently widowed Matthew Penny agrees to help Worthy Brown, a newly freed slave, rescue his fifteen year old daughter, Roxanne, from their former master, a powerful Portland lawyer. Worthy's lawsuit sets in motion events that lead to Worthy's arrest for murder and create an agonizing moral dilemma that could send either Worthy or Matthew to the hangman. At the same time, hanging judge Jed Tyler, a powerful politician with a barren personal life, becomes infatuated with a beautiful gold-digger who is scheming to murder Benjamin Gillette, Oregon's wealthiest businessman. When Gillette appears to die from natural causes, Sharon Hill produces a forged contract of marriage and Tyler must decide if he will sacrifice his reputation to defend that of the woman who inspired his irrational obsession. 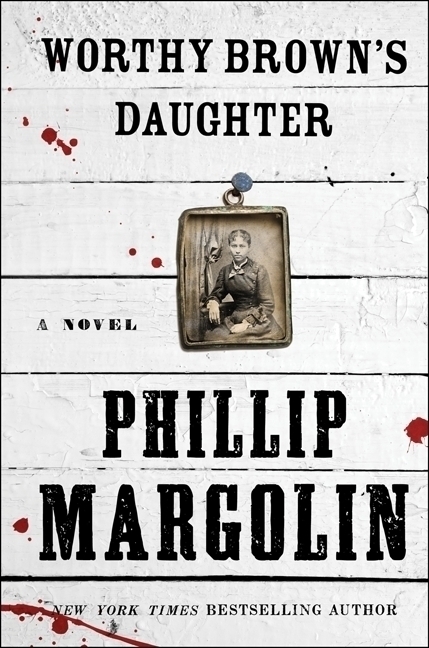 WORTHY BROWN’S DAUGHTER will be the sixth Philip Margolin novel I have reviewed. While this novel includes Margolin’s common themes of attorneys, court scenes and murders, this one is different in that it takes place in 1860 Oregon rather than in modern times. WORTHY BROWN’S DAUGHTER is loosely based on a true story of a slave owner who moved to Oregon from Missouri before it became a state in 1859. At the time, Oregon was very anti-black and their constitution banned free slaves from living in Oregon unless they resided there prior to the constitution. The slave owner promised freedom for his slaves if they helped raise a barn but reneged on his promise and kept several children as servants. The free slaves found a white attorney who successfully defended their rights to get their children back. In Margolin’s novel the freed slave is Worthy Brown whose daughter Roxanne is being held in servitude by ruthless lawyer, Caleb Barbour. Brown asks white attorney Matthew Penny to help him free his daughter in exchange for some information about a case Penny is defending against Barbour and Benjamin Gillette, the richest man in Oregon. When Worthy Brown is later found standing over Barbour’s dead body, he becomes the prime suspect in the murder. With Barbour dead, Penny’s focus turns from freeing Roxanne to defending Worthy Brown. Only Brown and Penny know the truth about the murder, and Penny has to find a way to separate truth from justice to free Brown. Although this story-line is the main theme of the book, several other interesting stories that involve Matthew Perry overlap it. In one story-line, Penny, who has mourned his wife since her death on the wagon trip from Ohio to Oregon, is enamored by Gillette’s daughter, Heather. The second involves Sharon Hill, a scheming murderous prostitute from San Francisco who finds her way to Oregon. Margolin smoothly blends these story-lines into a cohesive novel. Using extensive research material, Margolin’s re-creation of Oregon and San Francisco life of the early 1860s is very picturesque. The inclusion of the state of racism at the time and the early legal system with its judges riding the circuit provide the reader with a historical perspective of how these issues impacted the transaction of the law. With this as the background, the court scenes become very colorful and entertaining. As with his prior novels, Margolin displays his ability to develop great characters, perfect timing and an outstanding plot. WORTHY BROWN’S DAUGHTER is a well written legal thriller based on a historical perspective with plenty of twists and turns to satisfy any reader. I'm not usually drawn to that time period but this sounds very compelling.